Underhill, Paco. 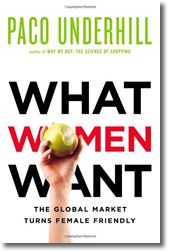 What women want: the global market turns female friendly. Simon & Schuster, 2010. The author of the classic best seller Why We Buy describes the new economic and social power that women now bring to the market, influencing product design, marketing and service. With record numbers of women entering professions such as law, medicine and business, women control a significant percentage of household purchasing power and it is good business to cater to their preferences. So what do women want? At the base level, Underhill says that women want cleanliness, and also control, safety and consideration. Products that address those desires will be successful and those that do not will lose sales. He discusses a range of topics including kitchens, bathrooms, home offices, hotel rooms, cosmetics and food, providing meaningful insights and clever observations about women’s preferences. The book is an entertaining and lively read into one man’s opinion about women and their values and desires, with occasional lapses into stereotypes. Sometimes the writing is overwrought – Underhill describes newer bathrooms as the “space where hedonism, fantasy, luxury… collude in a miasma of mist, steam, fragrance, occasional candlelight, and a sense of delicious, unhurried aloneless.” And sometimes the associations seem forced. According to Underhill, McMansions are the “penultimate guy dwellings” and are on the way out. By contrast, the megakitchen, a woman’s showroom of gadgets, fixtures and appliances, such as a $30,000 stove, is a developing trend. Other observations and insights ring true. Bottom line, this book presents adaptations that companies can make to win female customers. Many Fuqua students travel – hmm – scratch that and replace with all Fuqua students travel. Over the years we’ve collected a number of Pimsleur language instruction CDs which have been extremely popular campus-wide. And though we have CDs for French, Spanish, German, Portuguese, Russian, Mandarin, and Hindi, there were languages we didn’t have. However, all that’s changed. The Duke Libraries have recently subscribed to a new online language instruction resource called Byki Online. With over 70 languages, from Afrikaans to Zulu, you’ll find blogs, flashcards, words-of-the-day, and many other tools to speed your conversational skills. You can locate additional information here, and after signing up, start your new language adventure. Book Reviews: Start Your Engines! This year marks the 100th anniversary of the first Indianapolis 500 race. I grew up down the street from the Speedway track and I can still remember the great drivers from my childhood, Mario Andretti, A.J. Foyt, Parnelli Jones, the Unsers. . Beyond entertainment and transportation, the automobile was central to the lives and livelihoods of people from the industrial Midwest. Family destiny was entangled in the ups and downs in Detroit. My father felt that the industry was the ticket to the middle class and he pushed his children into automotive engineering. Only one child followed his advice, my younger sister, but by then the world changed and her experience has been laced with disappointment. So goes the entire American auto industry. Here are five excellent new books in the Ford Library talk about the industry, in good times and bad. Crash course : the American automobile industry’s road from glory to disaster, by Paul Ingrassia. 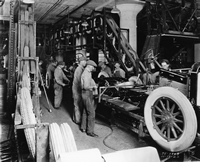 Pulitzer Prize winning author takes a deep look into the turning points in the history of the U.S. auto industry, highlighting the self-destruction of the automakers, their dysfunctional corporate culture and perverse union practices. At the crossroads: middle America and the battle to save the car industry, by Abe Aamidor and Ted Evanoff. The story of the auto industry crisis and its mark on small towns in Indiana, on the people who work in an industry in economic decline and who live in communities that are fading. Browse our DVDs in the library catalog (latest titles will appear first).